The Shomrim ("guardians"), a volunteer-based Jewish organization, has been keeping London's Jewish neighborhoods safe in cooperation with the Scotland Yard for years. 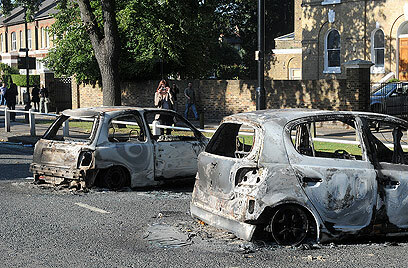 Now, with the riots in the British capital, their work has become doubly important. This week they have already managed to thwart looting attempts in one of the Jewish neighborhoods, in an operation befitting of a Hollywood blockbuster action movie. 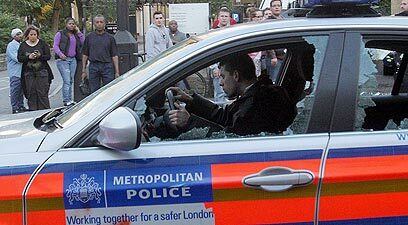 "We decided to go out and show a presence in the streets," chief executive of Shomrim North-West London Gary Ost told Ynet. "We realized that people start riots when there is no police presence on the scene, and then it is hard to control them, so we wanted to stop it in the Jewish neighborhoods before it gets started." On an average day, Ost says the volunteers responded to 300 calls – from break-ins and burglaries to missing children. Since the riots erupted, however, the phone has not stopped ringing. "It started as a small protest in Tottenham which is ten minutes away from the haredi neighborhood of Stamford Hill. Then some teenage boys began to riot and torched three police cars and a bus. Then the looting started," Ost noted. "I myself saw some guys walking down the street with laptops and plasma screens on their shoulders. The police was unprepared; they were scared to come out," he said. In contrast, the Jewish organization had a different response. The Shomrim decided to expand their operation, work around the clock on two 30-men shifts that patrol the Jewish neighborhoods in north-west London including Golders Green and Finchley. "We sat down with the police chiefs on Saturday night and on Wednesday and exchanged information," Ost added. Since the start of the riots, the Shomrim callers have expanded to include concerned citizens outside of the Jewish community. A few nights ago the Shomrim received a call alerting them to a case of looting in the area: "Someone called us and said they had witnessed a break in at a store. They described the vehicle including license number and we headed out. We arrived at the scene at 3am with four cars and Kevlar vests at the ready. One of the guys identified the car so as we were driving we slowly surrounded the vehicle on all sides…"
The local police force has been heaping praise on the volunteers who have speedily returned to their posts – both as Shomrim volunteers and as professionals in their field. "We all volunteer for the organization. Among us you can find lawyers, accountants and professionals in the real-estate sector," said Ost. Since Saturday we have been working our day jobs and keeping watch at night, with barely any time for sleep. I'm very tired but we have a commitment to our community and it needs to be kept safe. See all talkbacks "Jewish 'guardians' keep London streets safe"